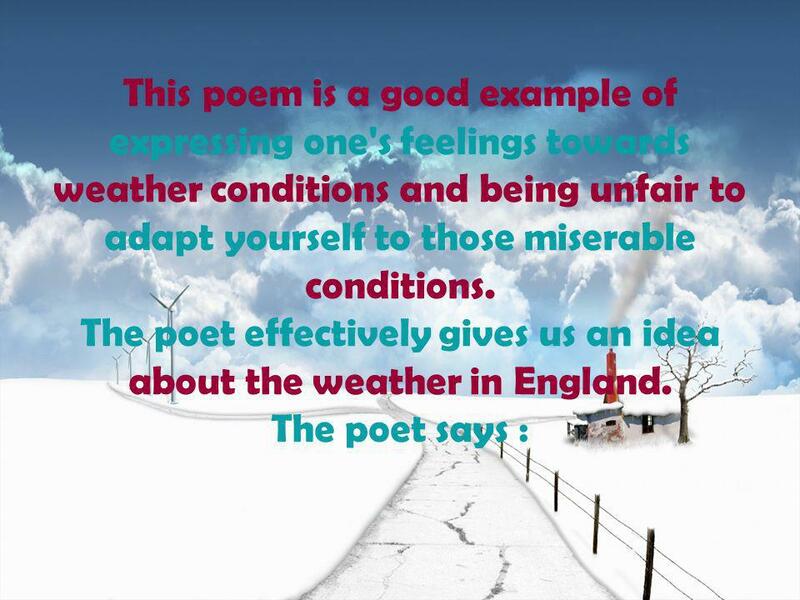 3 The main idea of the poem is that the weather in England causes some problems to children who have to follow certain system in their life. The sun rises late in winter and sets late in summer. 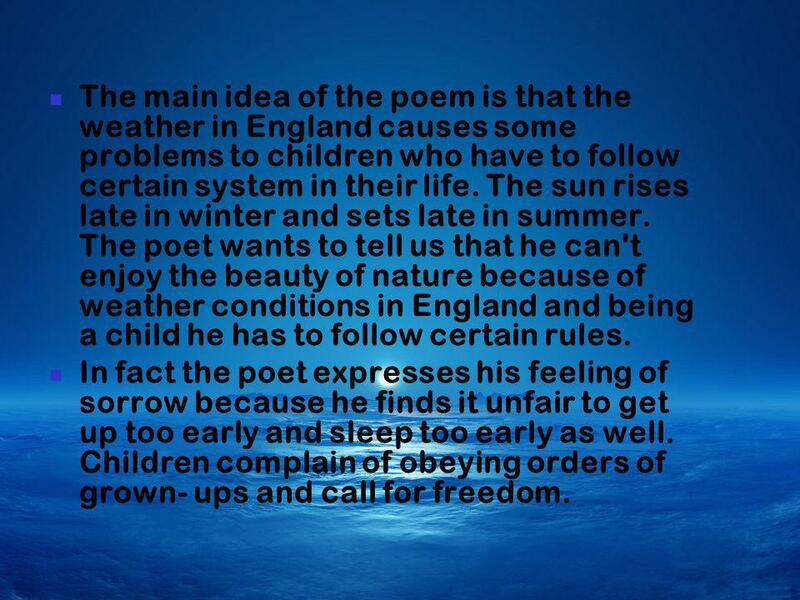 The poet wants to tell us that he can't enjoy the beauty of nature because of weather conditions in England and being a child he has to follow certain rules. In fact the poet expresses his feeling of sorrow because he finds it unfair to get up too early and sleep too early as well. Children complain of obeying orders of grown- ups and call for freedom. 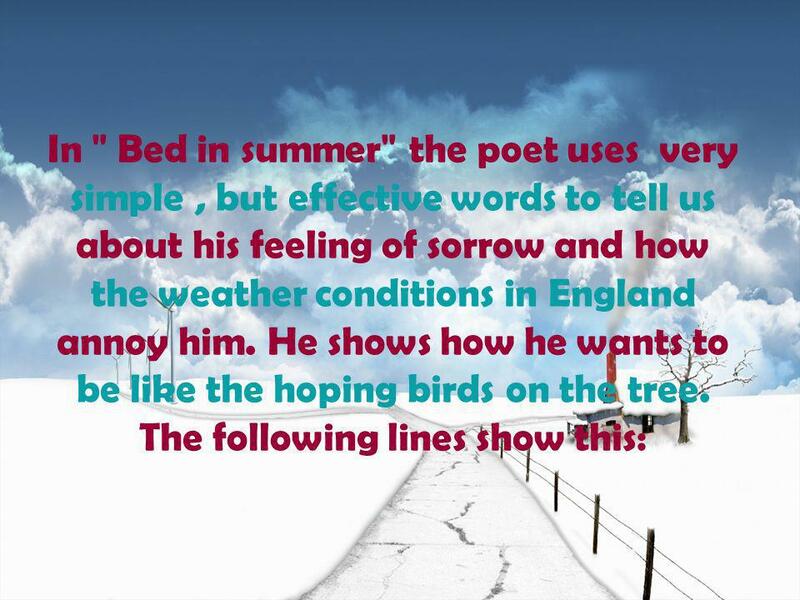 5 Paraphrase The poet is unhappy because he gents up early before sunrise in winter and at the same time, he goes to bed before sun- set in summer as the sun sets late in summer. 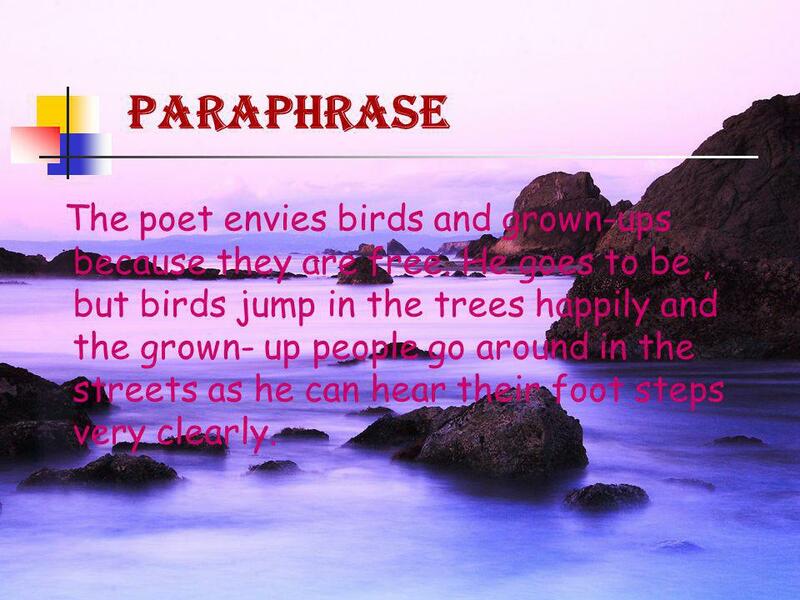 7 Paraphrase The poet envies birds and grown-ups because they are free. He goes to be , but birds jump in the trees happily and the grown- up people go around in the streets as he can hear their foot steps very clearly. 9 Paraphrase He makes it clear , by asking us a question which shows that he is sad and it is hard for him to go to bed while the sky is clear and blue. 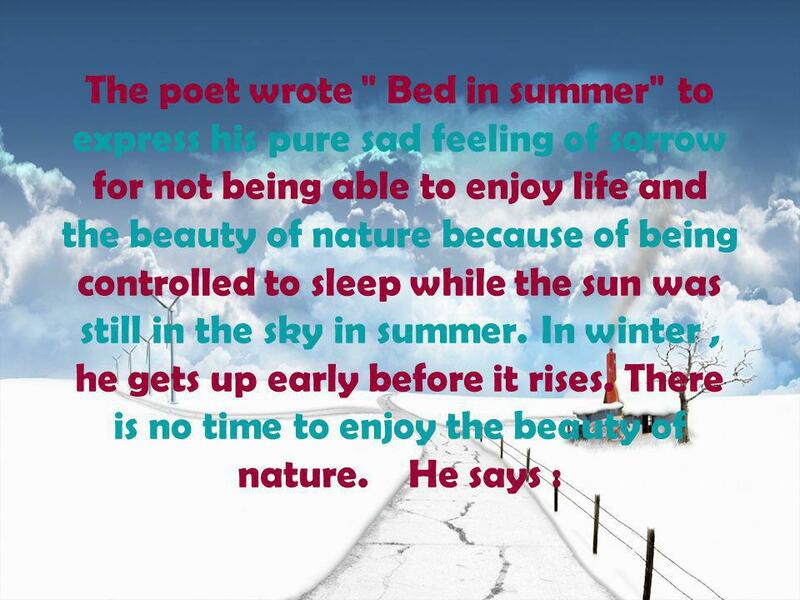 He is supposed to play and enjoy the beauty of nature instead of going to bed while it is still day time. 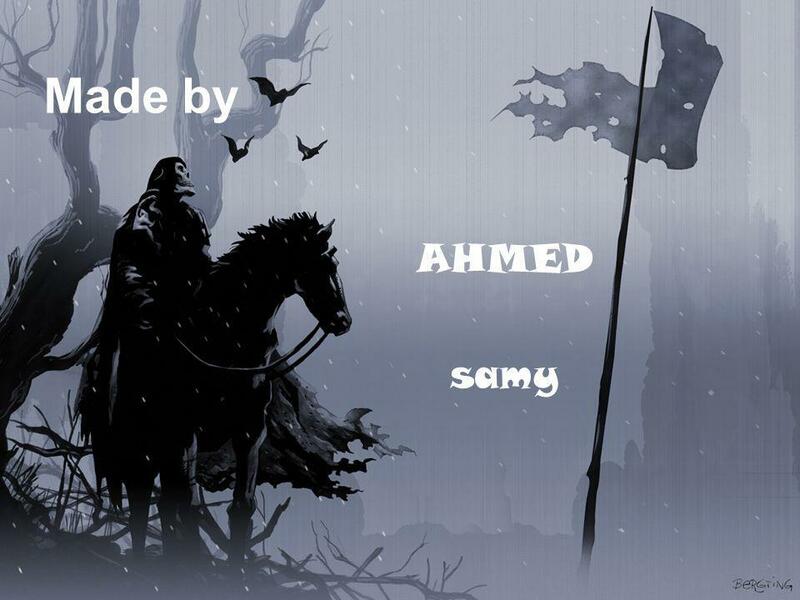 10 Commentary : - The poet succeeded in making us pity him. His way of writing is very impressive. He expresses the feeling of children who want to be free to enjoy life and nature. 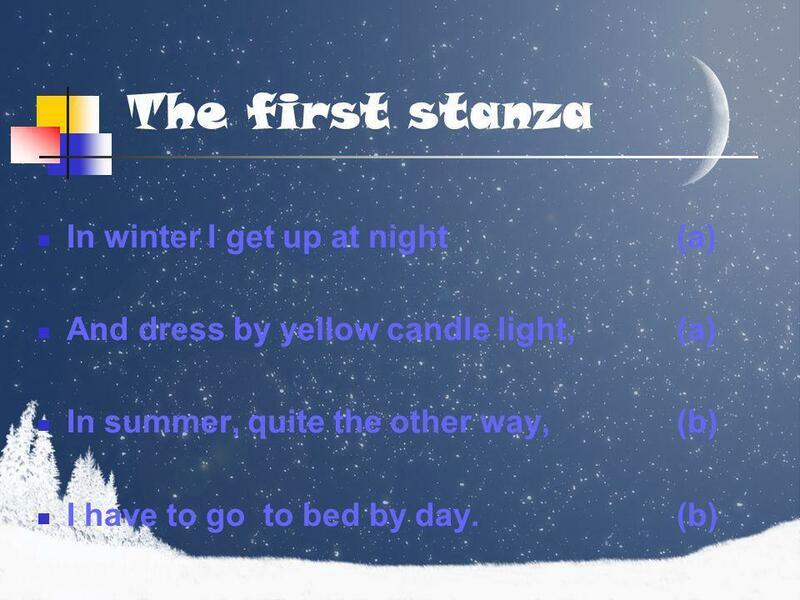 The poem consists of three stanzas that express one main theme (idea). 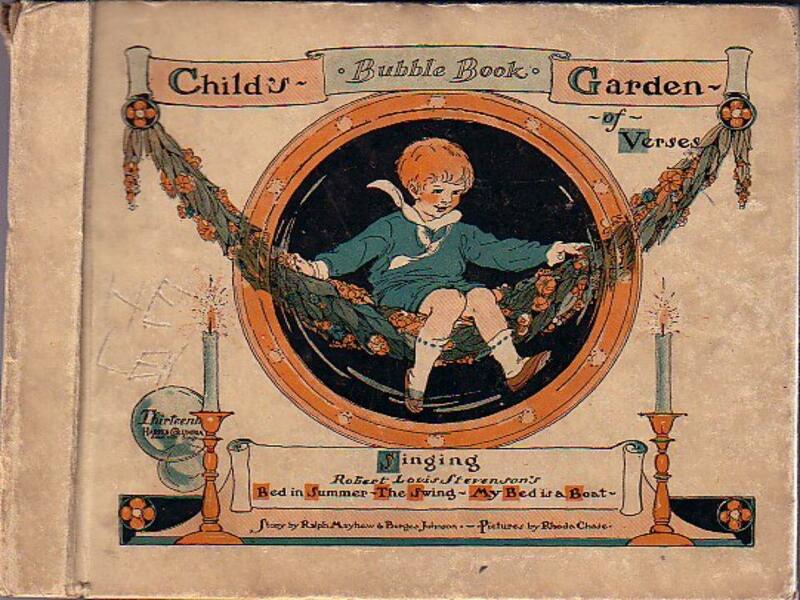 The rhyming scheme is aa bb - The rhyme helped the poet to express his genuine (pure and true) feeling of sorrow. 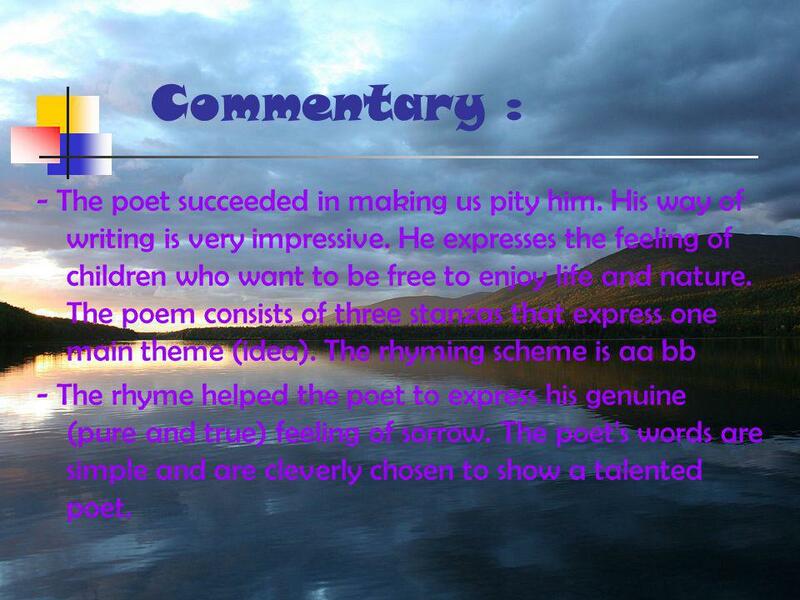 The poet's words are simple and are cleverly chosen to show a talented poet. 12 1- What have you understand from "Bed in summer"? 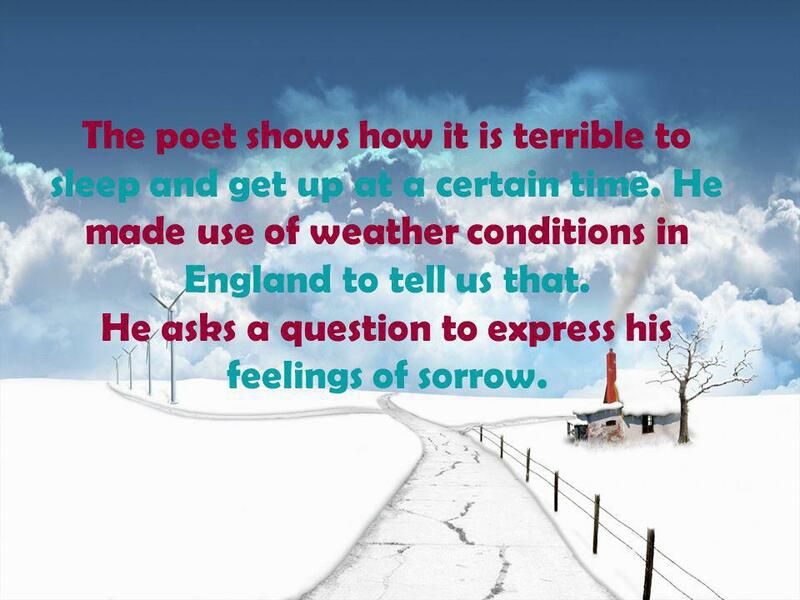 13 The poet effectively gives us an idea about the weather in England. And I should like so much to play, To have to go to bed by day. 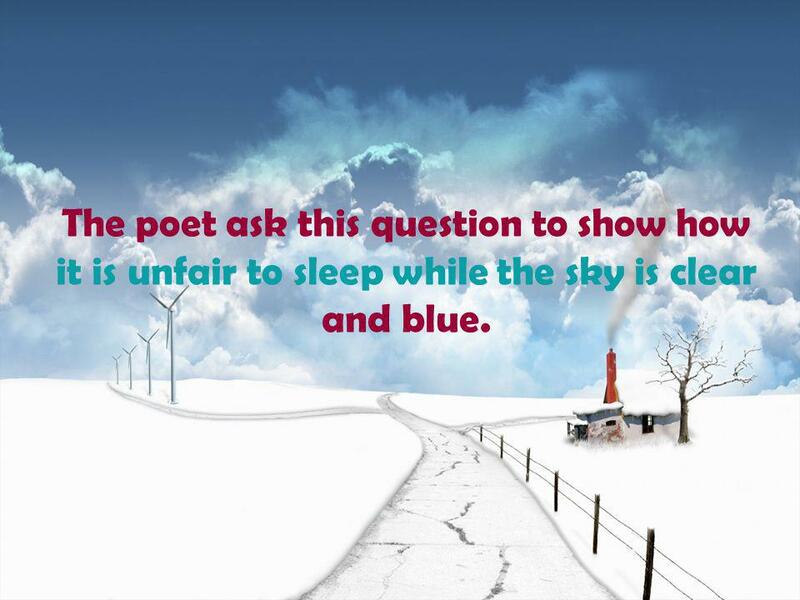 15 The poet ask this question to show how it is unfair to sleep while the sky is clear and blue. 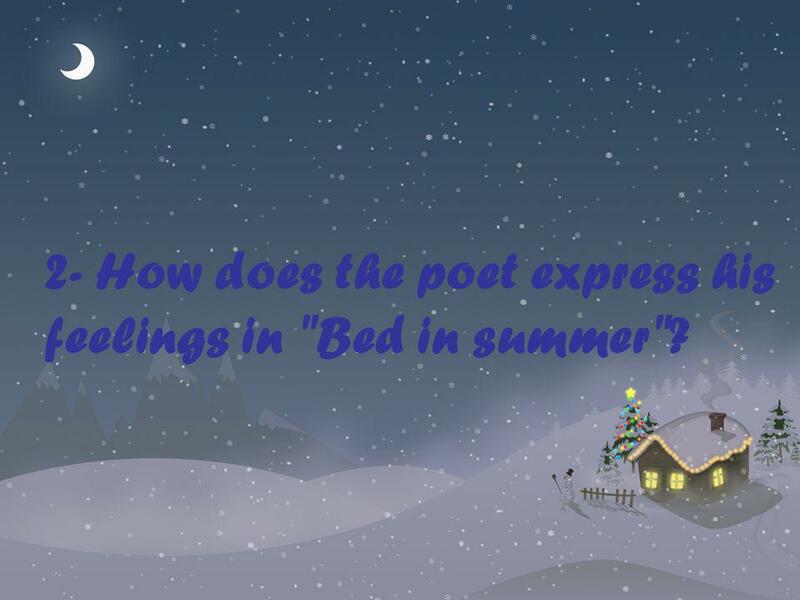 16 2- How does the poet express his feelings in "Bed in summer"? 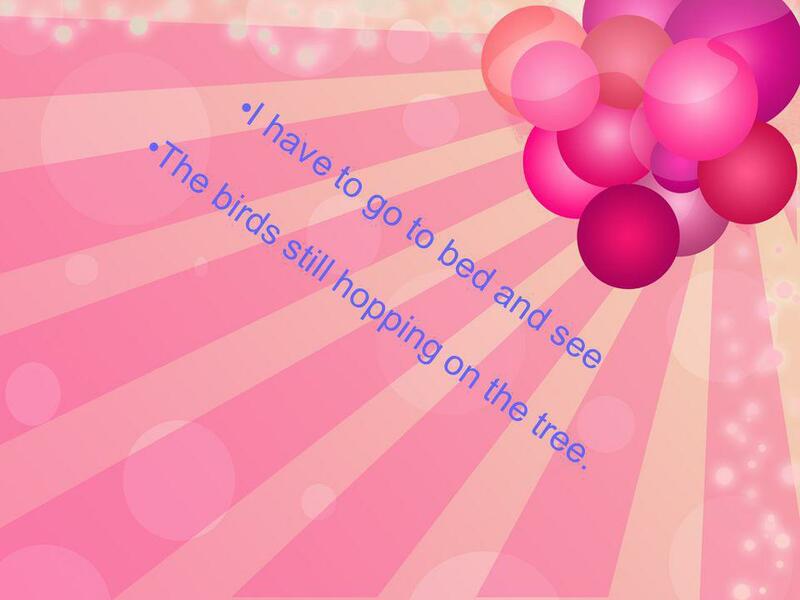 18 I have to go to bed and see The birds still hopping on the tree. 19 I enjoy reading the poem and found it impressive at the same time. 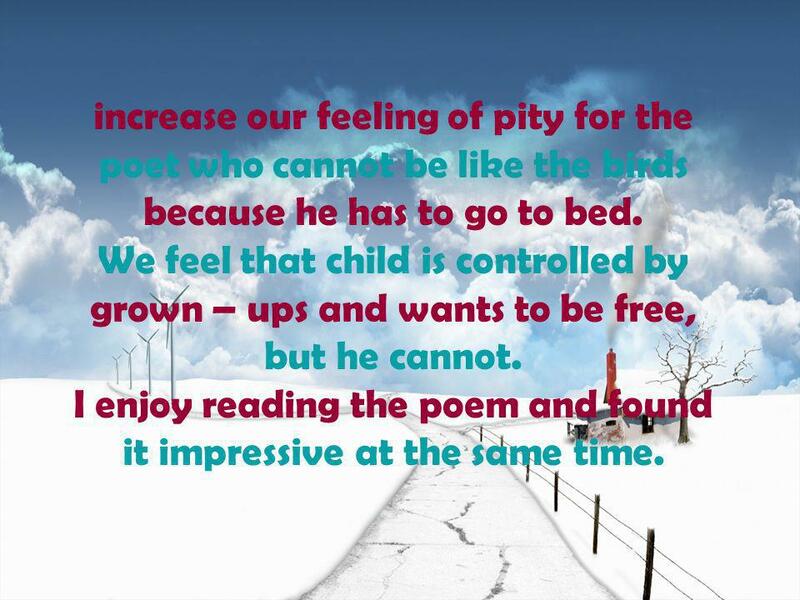 increase our feeling of pity for the poet who cannot be like the birds because he has to go to bed. We feel that child is controlled by grown – ups and wants to be free, but he cannot. I enjoy reading the poem and found it impressive at the same time. 20 3-Why did the poet write the poem "Bed in summer"? And dress by yellow candle light, In summer, quite the other way, I have to go to bed by day. 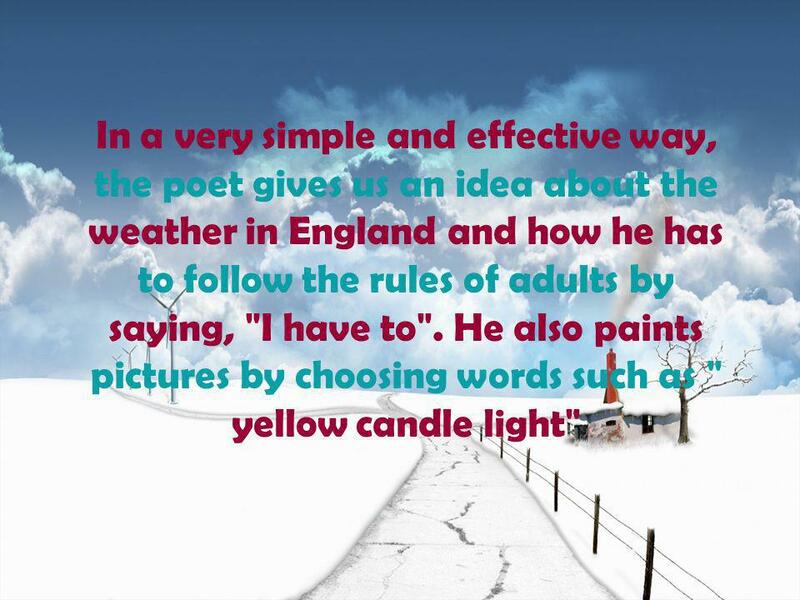 23 In a very simple and effective way, the poet gives us an idea about the weather in England and how he has to follow the rules of adults by saying, "I have to". 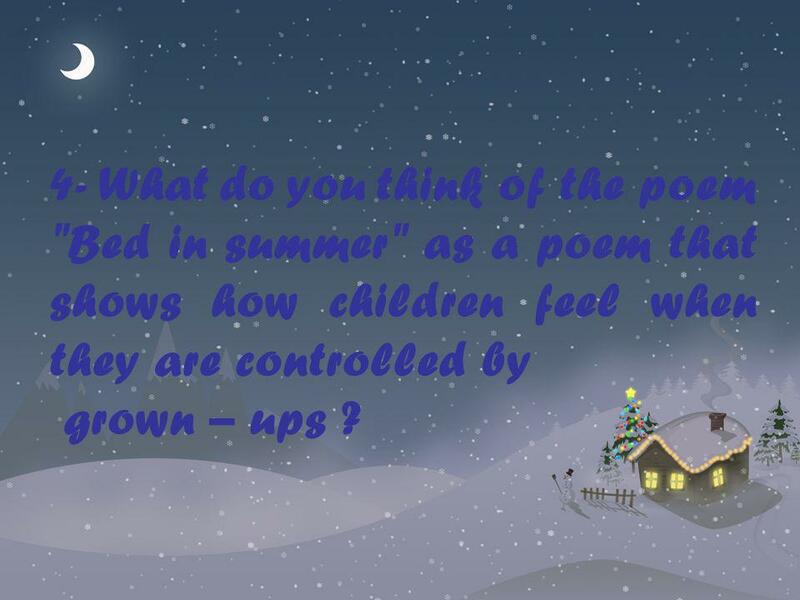 He also paints pictures by choosing words such as " yellow candle light"
24 4- What do you think of the poem "Bed in summer" as a poem that shows how children feel when they are controlled by grown – ups ? 25 He asks a question to express his feelings of sorrow. The poet shows how it is terrible to sleep and get up at a certain time. He made use of weather conditions in England to tell us that. He asks a question to express his feelings of sorrow. When all the sky is clear and blue, And I should like so much to play To have to go to bed by day. 27 We feel pity for a child who is controlled by adults. The choice of the word " hard" show that the poet is very sad and that affects us. 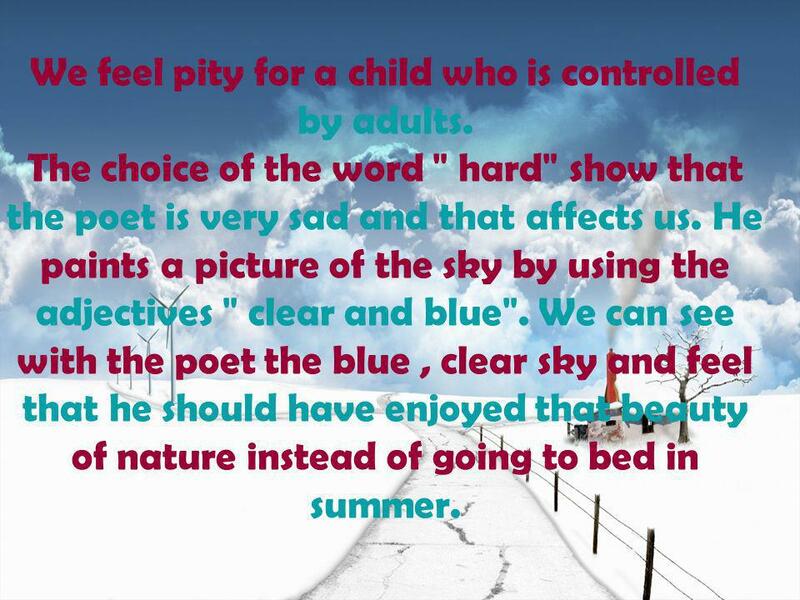 He paints a picture of the sky by using the adjectives " clear and blue". We can see with the poet the blue , clear sky and feel that he should have enjoyed that beauty of nature instead of going to bed in summer. 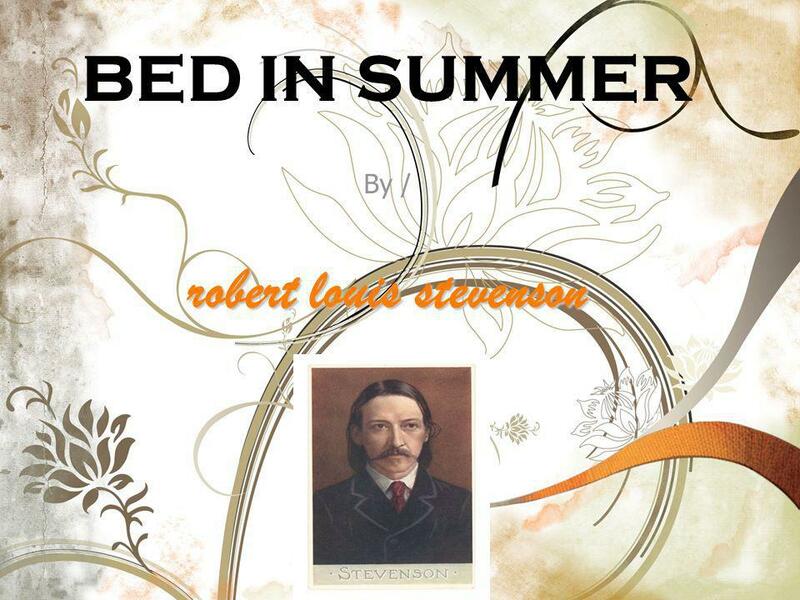 Download ppt "BED IN SUMMER By / robert louis stevenson"
Happy Hannah Little Pathways Series, Churches Peace Education Programme Written by Elaine Hall Illustrations by Joan McCabe. To be in love Gwendolyn Brooks Brooks was one of the earliest female African American writers to be published. A university teacher, she wrote a number. Poet Famous Emily Secluded D ickinson Simple Intelligent American. About two hundred years ago, an English poet by the name of William Wordsworth wrote that “we murder to dissect.” He meant that in order to study and. Poem: The Daffodils English, 9th Grade. Poetry Review Continued. Create a plot graph Select one of the narrative poems we read and complete a plot graph. Poetry Project Model English Class Ms. Johnson. Poem Selection A Dream Deferred By: Langston Hughes What happens to a dream deferred? Does it dry up like. The Dove Class X English Poem. Poetry Repetition, Alliteration, Rhyme. 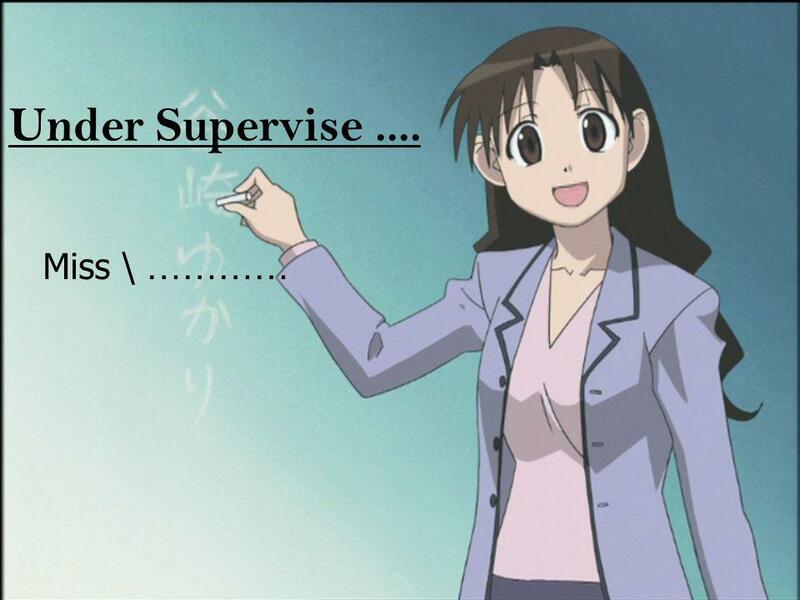 Repetition Repetition refers to words or phrases that are repeated Authors use repetition to: Draw attention to. Aim: How do we analyze poems to focus on the controlling idea? Romantic Elements. Imagination What is it? 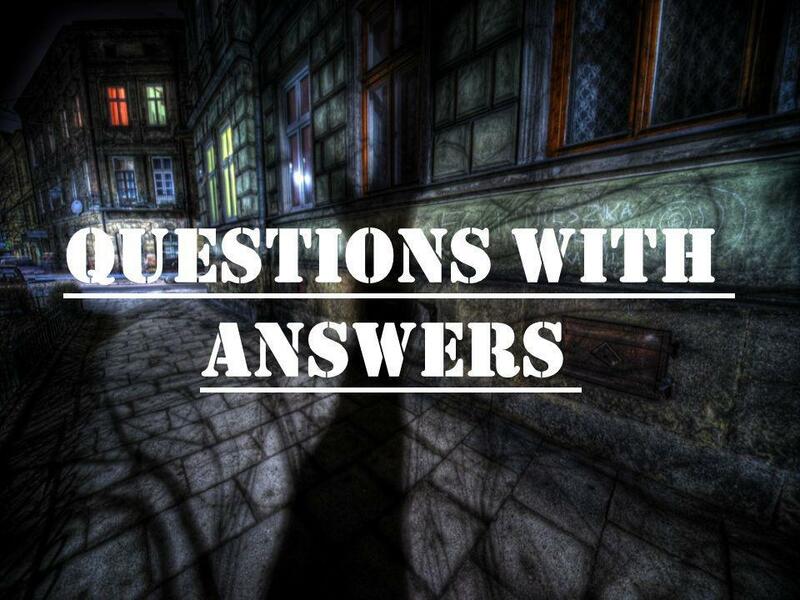 Deals with: –Creative ideas –Seeing what you want in the world around you –Paradoxes What is a paradox? –Two.